Mary and I flew from Florida to Alexandria, Minnesota where I was the keynote speaker and entertainer (singer) at their "Rally for America." As we approach another anniversary of the 9/11 attacks, I caught segments of various 9/11 documentaries on TV in the hotel room. I was struck by numerous stories of bravery and self-less acts of courage by our fellow Americans. A twenty-four year old man led a group of fellow employees to safety. He went back into one of the twin towers to rescue more, never to be seen again. A survivor spoke of the look in the eyes of a fireman going up the stairwell as he passed him going down. The survivor said he felt the fireman knew he was possibly going to his death. And yet, he was speedily taking two steps at a time up the stairs. I heard about a white man in one of the towers who upon hearing cries for help, pulled a brown man through a wall to safety. They both survived and have become life long friends. The incidents of Americans rising to the challenge on 9/11 are many. Some we will never know. But there was a group of Americans on 9/11 who for the most part were ignored. I am talking about "the jumpers." 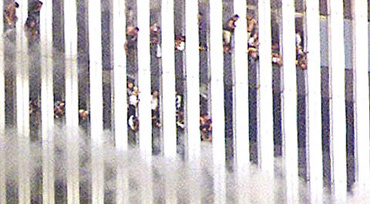 These people, like responsible adults, simply showed up for work on 9/11. Suddenly, they found themselves in an unimaginably horrific situation, having to decide whether to be consumed in an inferno or leap to their deaths. Dear Lord! Early after the 9/11 attacks, our liberal politically correct media put an "unofficial" ban on showing "the jumpers" in their coverage. Careful not to fuel American outrage, our media is always sympathetic to America's enemies. Like most Americans, I remember where I was and what I was doing on 9/11. I came out of the bathroom draped in a towel after a failed attempt to take a shower, "Honey, there's no water!" "Sorry", Mary replied. "I forgot to pay the bill." So, there I was annoyed because I had to drive two miles to drop a check off to the water company. That was my biggest "issue" of the day. Meanwhile, my fellow Americans were forced to decide whether to burn or jump. Witnesses saw a young woman high up in one of the towers at a window as flames raged behind her. She made the sign of the cross and did a swan dive out of the window. Ponder that image when you hear liberal Democrats, Progressives and Obama's pastor of twenty years, Jeremiah Wright, say we got what we deserved on 9/11. Innocent Americans simply showed up for work. Remember, the jumpers.